Just recently I realized I completely (and unfairly) ignored the whole category of posts about dancing: Wedding Dance and all the related information. Never once did I write about First Dance Lessons, songs brides and grooms choose for their Wedding Dance, videos (actual dance or instructional), etc. 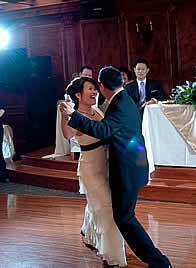 In the past I focused mostly on teaching Argentine Tango as my preferred dance, and only then on Wedding Dance Lessons. Yet, over the years I came to realize that I also enjoy teaching people their Wedding Dance, ans well as How To Dance, in general. As in: a couple puts on their favorite music (should be danceable), shoes (suitable for dancing), steps out on a dance floor (or finds/makes some space in their house, condo, apartment), and starts dancing with each other. What can be better than that? Teaching couples how to dance at their reception is quite similar to teaching folks how to dance. We just need to focus on certain things which are specific to a Wedding Dance. It has to have a few highlights – like a special opening and closing, for instance. Often the song the couple picks needs to be edited to make it better suitable for dancing, as motivations different than “danceability” govern the selection of their song. Maybe bride and groom met when that song was playing, maybe they kissed the very first time, maybe he proposed to that music… Other than that the First Dance training is similar to a general How-to-Dance lessons. So, stay tuned, bookmark this website and visit it every now and then, as I plan to “post early and post often”. Meanwhile, check out my students’ dance lessons testimonials here. Next post: You Too Can Learn How To Dance!